**Edited and updated to add this story about Michael Phelps. Thanks so much to one of the readers for sharing this because I think that perhaps this is a bigger accomplishment than a gold medal. THIS is the kind of young man that you want representing our country, one showing his compassion and strength of heart. Peyton has decided she’d like to swim in the Olympics someday. But on the men’s team…because they “win lots of necklaces”. Yes, that’s right, baby, it’s all about the bling. I will admit to acting like an absolute maniac when during the US Men’s 4×100 relay when they so totally snatched the gold from the French. If you’re French, I’m sorry for this next thing I’m going to say (not really). IN YOUR FACE, FRANCE! I don’t think the Olympics should be about talking smack, but if you’re going to do it, make sure it’s not against someone who can outswim you in the last 50 feet. Nathaniel was horrified to find out these two bits of Olympic trivia his first day back at school…1) The original Olympians were naked….2) A dead guy got an Olympic medal once. He explained that a wrestler got a guy in a hold that caused him to have his own windpipe blocked and he choked to death, but his hold on his opponent was so strong that the guy tapped out and they gave the gold medal to the deceased. I have no idea if that’s true, but it’s fascinating for a 10-year-old boy to contemplate. Nathaniel is having some serious issues with the naked sports…which, I can’t blame him…but mostly because he thinks having “everything just flopping out there while you’re trying to play volleyball or rowing a boat would be distracting.” I love that kid’s logic! I’d be more worried about the chafing, but that’s just me. 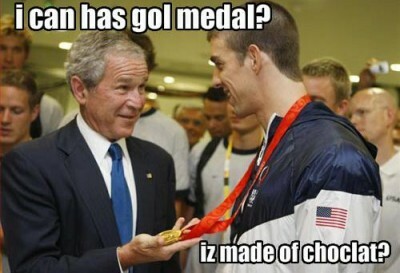 I’m only going to say it once more during this Olympics…Michael Phelps is HAWT! Love my Petey, but sheesh! Don’t worry, he’s been ogling the women’s volleyball team with impure thoughts. Last thing, I wanted to share the story of silver medalist Oksana Chusovitina. Her son was diagnosed with Leukemia at age 3, and she went to the Olympics wearing Germany’s colors because that is the country she had to move to for him to receive treatment. There’s nothing you won’t do for your kids. EVER. I will say that when there have been days that I can barely make myself get up and brush my teeth, let small accomplishments like laundry or toilet-cleaning….and this woman still managed to train for the Olympics. Wow. Double WOW! She probably doesn’t want to be thought of in terms of “the cancer mom that won an Olympic medal”, but in my mind, she’s the “cancer mom that proves you can still achieve your goals, even when childhood cancer comes into your life.” Silver medal WOW. Posted in: blogger stuff, Mayhew niblets, the cancer life, things our kids do. Wrestler that died and still won gold? True. I’m about to do a random Olympic post me own self. Great minds think alike. So, if you think Michael Phelps is hot! You have to read this and you will think he’s even hotter! there is a story there about him spending time with a young boy who had cancer and it shows that he’s a beautiful person inside as well. please comment in your post so that I know that you read it. It made me cry, I was so touched! I meant to post this the other day when you were talking about the cancer blogs you read. Here is a list of the blogs for children I check on regularly. Needless to say, I say ALOT of prayer! That article about Michael Phelps was very touching. He sounds like a real person. I read your lawn blog yesterday and it reminded that mine needed a few feet trimmed. So I mowed the entire yard all by myself!! Amy Nasworthys last blog post..School time!! Juliette and I have been watching the Olympics, mostly the gymnastics b/c well, as a momma I was hoping she would think it was “so cool” and maybe she would win mega bucks someday in an endorsement deal. New plan … first we’ll learn how to swim, then I’ll get up the courage to let her actually jump off the flippin board … and then, mega bucks endorsement deal. Sweet! I should know better not to read your post during a confrence call. You are so funny! I’m all about talking SMACK! You go girl! Sarah Clapps last blog post..Pot-Luck Concert Goer.. It always amazes me (although it probably shouldn’t) the places childhood cancer pops up. Thanks for sharing those two articles. Am I the only one that doesn’t think that Michael Phelps is total hotness? Oh well. I also haven’t watched a second of the Olympics. Therefore, my opinion probably does not count.